HOME > PRODUCTS > LEVEL INDICATORS > RLI "SHAKER"
Utilizing a unique stepper motor drive, the RLI “SHAKER” rotates clockwise, then counter-clockwise and then shakes to shed any excess material build up. If the paddle rotation is impeded at any time by the bulk material then the electronic circuit provides a signal for level indication or control. 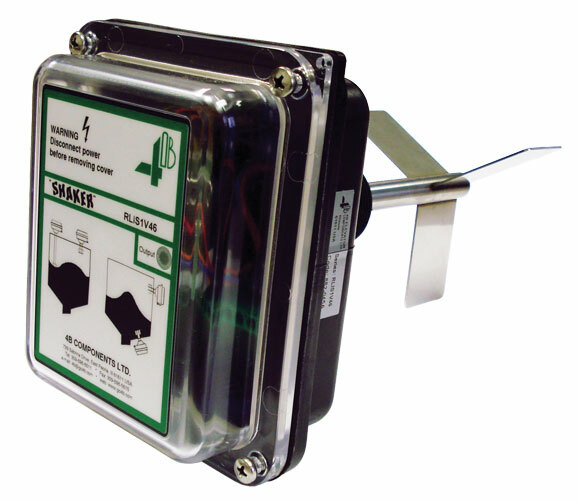 The RLI “SHAKER” uses fewer mechanical parts compared with standard rotary level indicators. No gearbox or clutch is required as the stepper motor drive is directly coupled to the output shaft and is practically indestructible and cannot be damaged by forced or backwards rotation. Also, an adjustable torque control allows one unit to cover many different densities of material, and provides easy on site calibration without having to change paddles. • RLIS1V46 ~ RLI "SHAKER"
compared to a standard rotary paddle level indicator.